One of the terms with which Republicans couch their conservative views is supply-side economics. It sounds innocent enough, but history since the “Reagan Revolution” has shown us that it tends to benefit the 1% (only in the short run) and stagnate growth for the remaining 99%. Ironically, one of the ways in which we might be able to fend off those advocating supply-side economics is to take a tactic that we’ll call supply-side democracy. 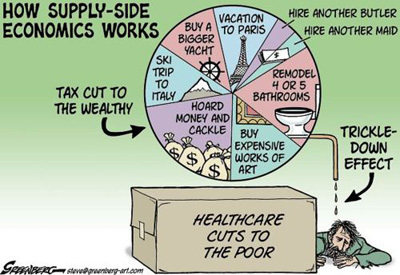 Supply-side economics is a macroeconomic theory which argues that economic growth can be most effectively created by investing in capital and by lowering barriers on the production of goods and services. According to supply-side economics, consumers will then benefit from a greater supply of goods and services at lower prices; furthermore, the investment and expansion of businesses will increase the demand for employees and therefore create jobs. Typical policy recommendations of supply-side economists are lower marginal tax rates and less government regulation. Supply-side democracy (which we are somewhat inventing here) is designed to take power from the entrenched and put it in the hands of individual citizens. In this case, think of supply as being the supply of voters in a democracy. In the United States that is now over 240 million people. The “demanders” would be the well-funded politicians who place demand after demand on the American people. First they want your money, and lots of it. Next they want your attention, and with the help of the mainstream media which is always in a position to make money from politics, they nag you day and night. The politicians set the agenda and the ones who often get the furthest are those who have the most money, either in their own campaign coffers or through the “generosity” of PACs and Super PACs that support them. This is not new or news. But what would be different with supply-side democracy is that there were be a fundamental change in tactics in working to reduce the role of money in politics. While it certainly would be helpful to overturn the U.S. Supreme Court’s Citizens United decision and perhaps more effective for Congress to pass new meaningful campaign finance reform with public funding of campaigns, these changes would have to be made by the already entrenched. Do not expect any quick action. What would happen with supply-side democracy is that the voters (the supply) would simply say that they would not vote for the candidates who are backed by large sums of money. Voters frequently say that they want a candidate who “is like them,” but how can any man or woman who spends months begging for money and kowtowing to those who have the money actually be like you or me? The fact that politicians need so much money morphs them into people who are fundamentally different from the people whose votes they seek. Less offensive negative political ads on TV. There are obvious hurdles to this approach, most particularly how does this idea get disseminated to the American people. But because the other solutions to limiting money in politics also seem to be long-shots at the moment, it would be worthwhile to consider an idea like supply-side democracy.